Almost everyone has a "skeleton" in their closet. A dark "thing" that they are not proud of. Equally, everyone has something in the past that they can be very proud of. The pleasant "things" boost your confidence, and improve your positive outlook towards life. However, the unpleasant "things" leave an impact as well. As you reminisce on the bygone days’ unpleasant memories, you may hear a scolding voice reminding you, "you failed", "you are no good at anything", "you will never amount to anything". It is painful to listen to. What you should keep in mind, is the fact that the past does not really matter any more. That is history, especially the unpleasant "things" should immediately be denied power over you. It does not help dwelling on the past, it is history, and should be forgotten. Just pick out the lessons from past failures, and move on. Life is not about looking back in regrets. Life is something you want to live every day, enjoying every moment, living life to the fullest. Get rid of disturbing memories of the past. 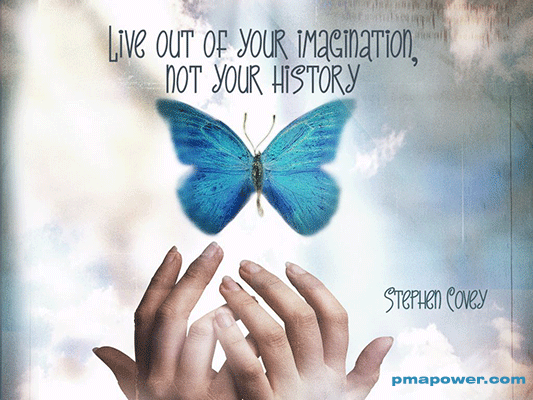 Instead of letting the past haunt you, develop a strong faith in your dreams, and trust your imagination. The more you trust your dreams and imagination, the better they will serve you. Dreams and imagination will propel you to places you have never even thought of before. They empower you to do extraordinary things. Dreams and imagination define the spirit within you, and they push you to fly beyond your perceived limitations, that were holding you back up to now. The more you trust in your dreams, the more fire you will have in your belly, and your life will make strides by leaps and bounds. Unlike dreams and imaginations, which are positive powers in your life, all that your past history can do, is breed misery. The past painfully reminds you of the times you failed. Dreams and imagination lift you up, and fly you into the bright future you deserve. Almost everyone has a "skeleton" in their closet. A dark "thing" that they are not proud of. Equally, everyone has something in the past that they can be very proud of. The pleasant "things" boost your confidence, and improve your positive outlook towards life. However, the unpleasant "things" leave an impact as well. As you reminisce on the bygone days’ unpleasant memories, you may hear a scolding voice reminding you, "you failed", "you are no good at anything", "you will never amount to anything". It is painful to listen to. What you should keep in mind, is the fact that the past does not really matter any more. That is history, especially the unpleasant "things" should immediately be denied power over you. It does not help dwelling on the past, it is history, and should be forgotten. Just pick out the lessons from past failures, and move on. Life is not about looking back in regrets. Life is something you want to live every day, enjoying every moment, living life to the fullest. Get rid of disturbing memories of the past.